I get super excited when my mom asks me what I want for dinner..and she usually makes what I want (or similar) as sometimes my requests are ridiculous. But we haven’t had a Korean meal for dinner in a while and we need to eat some stuff from the freezer, so this was perfect! 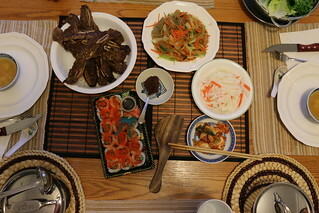 My mom had frozen short ribs at home and as well as dried noodles (for the japchae). If you’re not familiar with japchae, it’s basically clear noodles and vegetables seasoned with sesame oil and black pepper (in my opinion). Boil a pot of water and cook the noodles till soft. They will take some time, but not al dente like spaghetti. 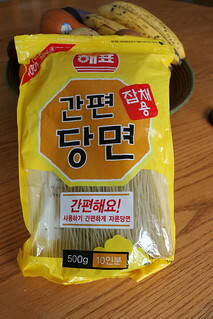 I’m not sure what the Korean name of these noodles are called. 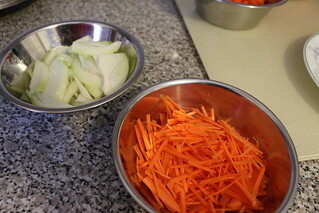 The vegetables are kept simple, sliced onions and carrots. But I’ve seen some other vegetables, even eggs being served with japchae. Stir fry the noodles with the vegetables. Add black pepper, soy sauce, sesame oil and salt. The finished product, don’t forget to garnish with white sesame seeds and green onion (optional). *I did not post a full recipe because there isn’t one that my family follows. We observe what is served in restaurants and in the grocery stores. 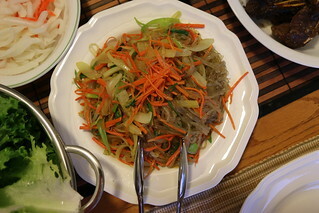 This is a simplified and modified version of japchae. 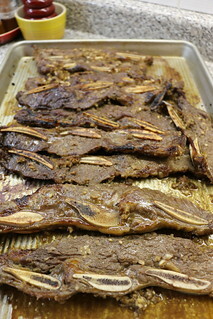 Kalbi, or Korean short ribs is very popular around where I live. This might not be the authentic Korean style of kalbi, but it’s the closest thing to it that we can try to make at home. 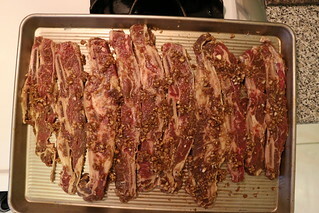 The short ribs are marinated with A LOT of garlic, a ripe apple or pear finely cut and paste like, soy sauce and salt. We usually marinate them over night, to let the flavours mix together. Place them on a baking sheet (for oven) or you can barbecue them. Position the oven rack to the top and preheat the oven to broil on high. 15 minutes on each side should cook them through, depending on how think or thick the cuts are. What and how we eat the ribs, you ask? We wrap the beef in lettuce and put kimchi, korean sauce or whatever you like, and eat it like you would a taco. It tastes ten times better and plus you’re eating with your hands. GET MESSY! An aerial view of the dinner table. My mom bought some california rolls from the supermarket as well as some pickled carrots and radish. It was indeed a lovely and comforting meal, as we don’t often cook up a ‘storm’ like this.